I was watching one of my favorite British Youtubers the other day, and he did a psychology test that I found fascinating. Clear your mind and follow along. Ready to find out what your imagination says about you? Read on! The Cube: This is how you view yourself and your surroundings. I suppose this means that I see myself as a shiny, but fragile object: easy to see through, but also reflective and equips others to see themselves better, too. The Ladder: This represents your friends. The wooden ladder is standing strong on its own, which many of my friends do, and have the potential to bring me to a higher level that I couldn’t get to by myself. The Horse: This symbolizes how you visualize your love interest/an important relationship that you are in. I imagine my future mate to be someone that is “wild” and exotic, knowledgeable of the world and street-smart. But as it was calm, saddled and tamed, he has been refined and educated, and is ready to carry me out of the desert. The Storm: This stands for the trouble in your life and how you view it. The sandstorm I saw was caused by my surroundings, and not by nature (like a thunderstorm). I see that many of my problems aren’t caused by circumstance or any one person, but by the surroundings I put myself into. Fortunately, it was off in the distance and in the opposite direction of my horse, which hopefully alludes to how my relationship and my troubles won’t be linked. The Flowers: These represent your children, how many you want, and show what kind of people you want them to be. The several roses I saw were healthy and vibrant, even though they were lying on the desert floor. I see my children as standing out in their surroundings, being pruned, elegant, refined, and in full bloom no matter where they are. 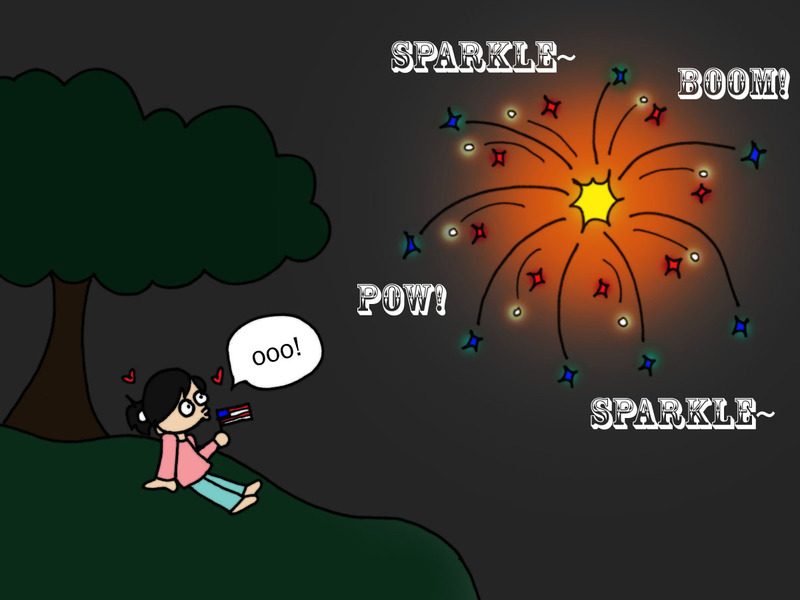 Happy Independance Day, my lovely readers! America! WHOO! This past week has been incredibly eventful. It all started last Friday, when 3 million people (including the Whang Gang) lost all power. And boy, was it sudden! That weekend, our family pow-wowed in the basement to keep cool in the 100+ degree weather until (thank God!) we regained power Sunday early afternoon. I was suddenly reminded of the blackout in Haiti, and I couldn’t help but feel immense gratitude and thankfulness for the situation that our family was blessed to be in, despite the lack of power. The fact that we have a basement that keeps cool without air conditioning, and clean, running water that allowed us to drink, cook, clean, and wash up…I was re-humbled and re-invigorated for my next trip to Haiti this October. After the hullaballoo of settling back into our re-powered house, we got ready for the 4th of July! Our family celebrated by participating in a sponsored event at the Columbia Sheraton Hotel, where we had a beautiful front-row seat to the fireworks show. This weekend, the Whang ladies are heading out to Pennsylvania for a girl’s night on the town! If you’ve been reading this blog for a while, you’ll know that any time spent with my Mom and my sister will bring about some crazy memories. Look forward to it! Mwah!